My all-time favorite trend at the moment is dark lipstick. I’ve loved red lipstick for quite a while, but it’s only recently that I’ve started getting into the darker colors. I’ve started to build up a collection of a variety of different shades, which is fun because it allows me to coordinate my lipstick with both my outfit and my mood. 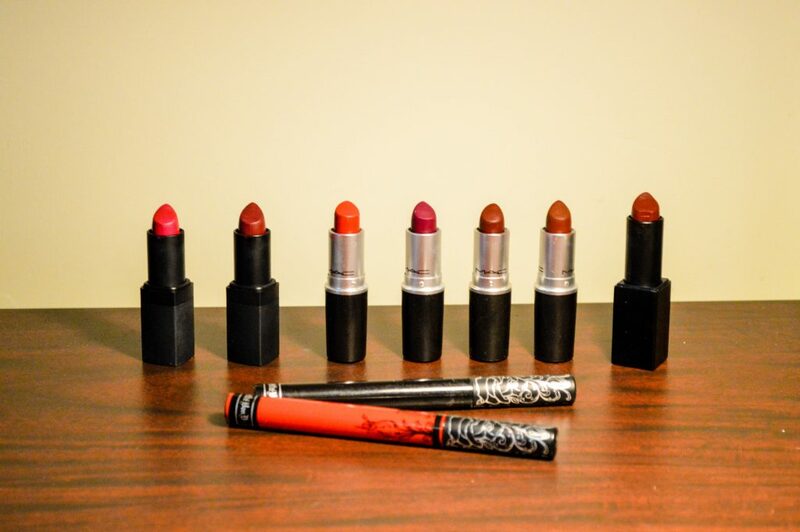 I also generally tend to find favorite formulas and stick with them, so you’ll notice that all of these lipsticks come from three different brands: MAC, NARS, and Kat Von D. From my experience, all three of these brands generally deliver good pigmentation and a long-lasting formula (if applied correctly), so I can buy new colors on a whim and not worry about whether or not I’m getting a high-quality product. 1. NARS Lipstick in Funny Face: This is the pinkest lipstick on this post – the color actually toes the line between being considered a “bright lipstick” and being considered a “dark lipstick.” I love going for this color when my whole outfit is neutral because it adds a great pop of color without being overwhelmingly bright. 2. Kat Von D Liquid Lipstick in Sante Sangre: Liquid lipsticks are quickly becoming my obsession, and the formulation of the Kat Von D ones is my personal favorite. This is a bright, true red (that leans just slightly orange-ish depending on your skin tone). 3. MAC Lipstick in Russian Red: This is a cult favorite for a great reason. It’s a unique red – it’s a bit darker than most red lipsticks without getting overly brown or overly purple. It also has some minor blue undertones (aka makes your teeth look whiter), and it has a fantastic matte finish. 4. MAC Lipstick in Rebel: I honestly think this swatch makes the color look like more of a true berry color than it actually is. On me, it’s much more purple. 5. NARS Lipstick in Scarlet Empress: This could also be considered a “berry” color, because it is a bit sheer, but with a second coat it’s quite obviously in the burgundy family. It’s got a lot of purple in it as well – it wasn’t quite what I expected when I bought it because it looks so much darker in the tube, but I’ve definitely grown to love it. 6. NARS Audacious Lipstick in Bette: This is my holy grail lipstick. If you buy one tube from this post, buy this one. 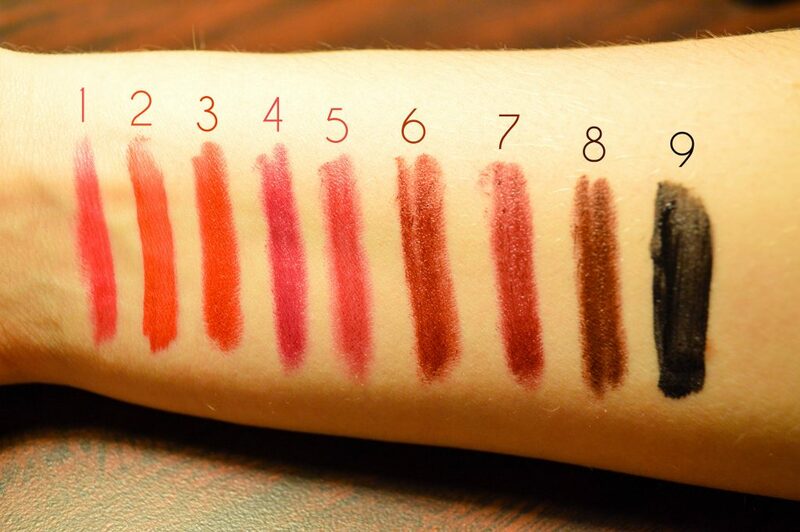 It is the prettiest burgundy color, and is such a fantastically creamy formula. As trade-offs always occur between moisture level and longwearing capabilities, this color requires a bit more application than I’d like, but it’s so worth it. 7. MAC Lipstick in Media: This color was actually my first real foray into dark lipstick. I got it sometime freshman year, and wore it on a 90’s themed date night – and thus, my love affair with dark lipstick began. This color falls somewhere between a dark purple and a brown. 8. MAC Lipstick in Antique Velvet: This is a solid true brown. It’s completely matte and really cool-looking, although if you try to just swipe it on and walk out the door, it’ll fade off the moment you take a bite of food. Apply, dab it off, then add another coat and you’re golden. Also, this color makes me feel like Kylie – I don’t know if that’s a good thing or not, but it’s a thing. 9. Kat Von D Liquid Lipstick in Witches: No dark lipstick collection would be complete without a true black. I wear this color sparingly – it’s a bit intimidating and can occasionally give off a goth vibe that doesn’t suit me at all, but it’s really fun to wear with an otherwise super-girly outfit as an unexpected punch. This particular shade of black is highly pigmented and stays on so well. If you have any new dark lipstick shades I should try, please let me know in the comments! I’m always looking to expand my lipstick collection (as unhealthy as that may be for my bank account). All of these colors are so pretty! I love 2 and 3!